(Bloomberg) -- Novatek PJSC is looking at power generation to unlock demand for liquefied natural gas from its massive projects in Russia’s Arctic. The world’s biggest energy companies will gather at the LNG2019 conference in Shanghai next week amid increasing pressure from investors to protect their business from a shift to lower-emission fuels. While many nations favor renewables as they seek to combat air pollution, gas is a cleaner alternative to coal to address the intermittent nature of power from solar and wind. As a first step, Novatek has already teamed up with Siemens AG to explore cooperation in areas including LNG supply and power generation. 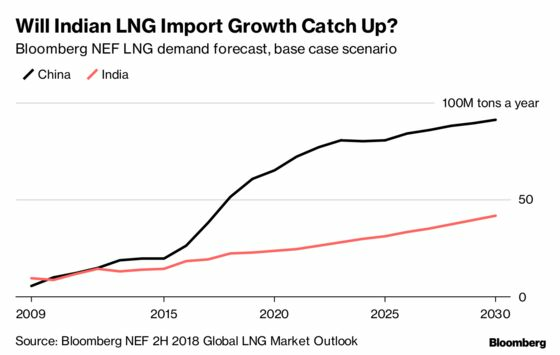 China’s unprecedented drive to switch from coal to gas and become the world’s second-biggest LNG importer demonstrates that “the push to clean air has already begun,” Gyetvay said. India and markets in southeast Asia are expected to follow. Spot LNG has crashed almost 50 percent since the start of the year to $4.60 a million British thermal units, and lower prices are seen as a trigger for demand in nations that would otherwise opt for dirtier coal or oil. “LNG companies with a significant amount of spot exposure have the most to lose from weak spot prices in 2019,” Sanford C. Bernstein & Co. analyst Neil Beveridge said March 26 in a note. The New York-based researcher sees prices returning to $8 a million Btu by the next northern hemisphere winter. Gyetvay is unfazed by what he sees as a “very, very short window of lower prices” due to the multidecade nature of LNG projects. While on a short-term basis, there will be impact on profitability, most of Yamal LNG’s contracts are linked to crude, diluting the impact of spot price dynamics, he said. Yamal LNG’s first production line, or train, has now switched to supplies under its long-term, oil-linked contracts, and Train 2 is starting to, Gyetvay said. Train 3 started a year ahead of schedule, and its early volumes are sold on a spot basis, as is typical for new LNG plants.